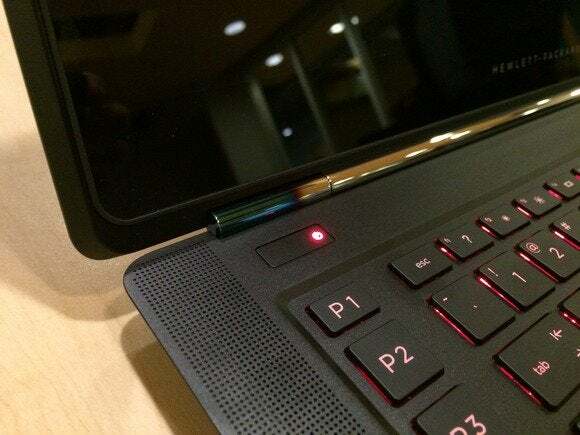 HP will have to lure users from established brands, including Alienware, MSI, and Razer. But it’s not fooling around: The Omen bristles with game-ready features that the company hopes will speak for themselves. 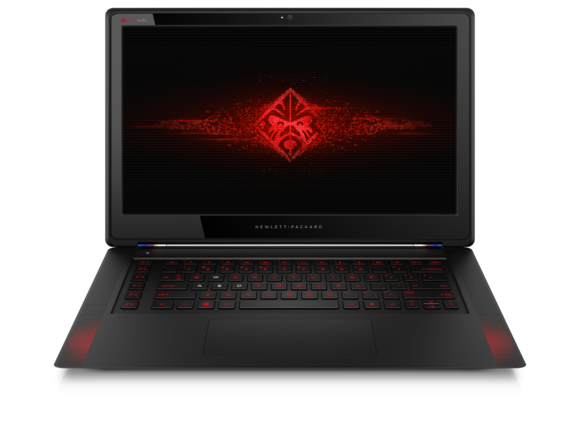 HP’s new Omen gaming laptops will start at $1499 for systems with Intel core i7 CPUs, Nvidia GTX 860M GPUs, and many, many more goodies. And what do those features say? Intel Core i7 4710HQ CPU, running at 2.5GHz and boostable to 3.5GHz. Nvidia GeForce GTX 860M GPU. SSD all the way, including PCIe in higher-end SKUs. There’s a roomy, 15.6-inch, 1080p touchscreen. 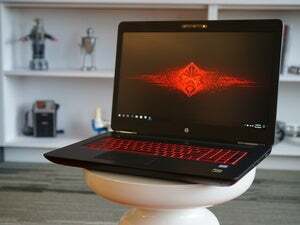 HP says the Omen weighs 4.68 pounds and can last up to four hours and 45 minutes on its 4-cell, 58WHr lithium ion battery. Going with SSD obviously promotes fast boot times. While the entry-level Omen ($1500) will have a 128GB SATA SSD, higher-end units will use PCIe for even faster performance. Nash said the 15.6-inch display’s rather pedestrian 1080p resolution was a deliberate decision. “Gamers care about frame rates. They prefer 30-plus fps at 1080p,” Nash explained. In other words: If you really care about gaming performance, you’ll take 30-plus fps on a “low” resolution over slower frame rates on a trendy 4K display. Sticking to 1080p also keeps heat and battery life under control. 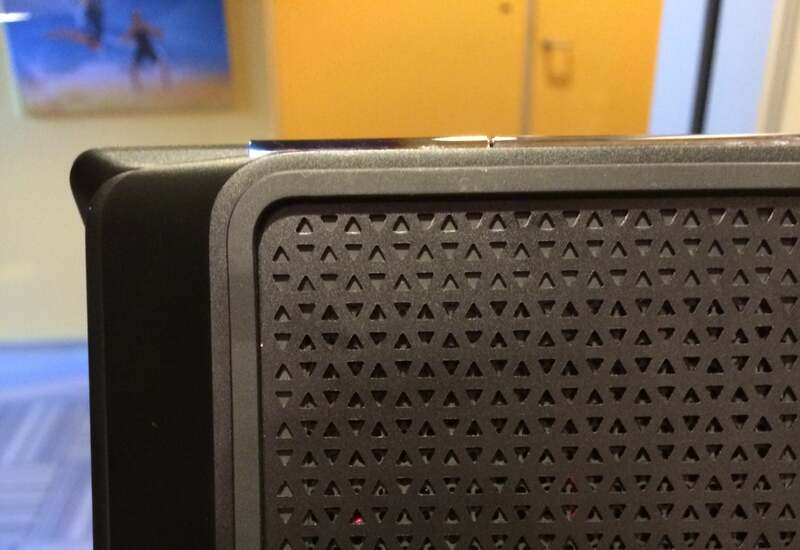 The entire bottom of the HP Omen is vented to aid in cooling. The anodized aluminum chassis includes a fully vented bottom panel. Two rubber feet run almost all the way around the bottom, save for openings at the front and back. Dual intake fans pull in cool air from the front, and hot air exhausts out the back of the unit, underneath the hinge. The Omen’s display is actually raised a little bit to keep it farther away from the hot exhaust. 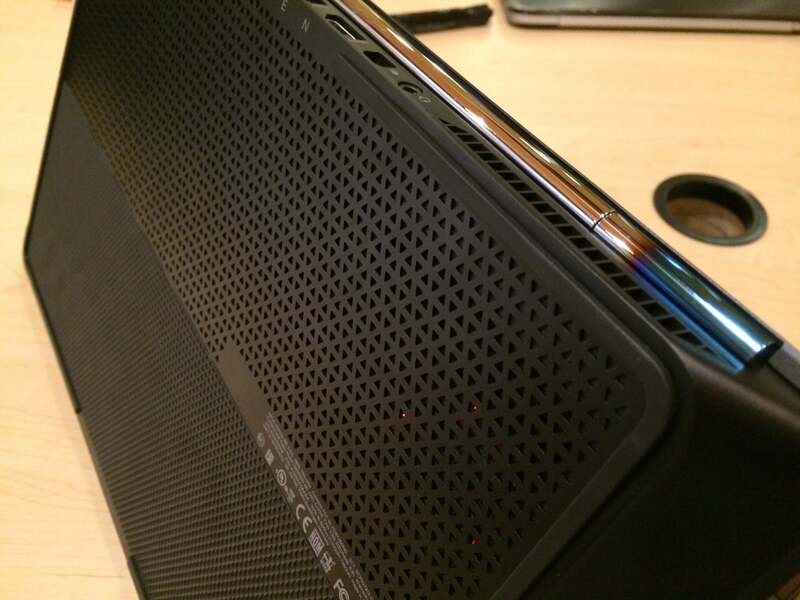 To maximize cooling, the HP Omen has vents all along the bottom. The rubber foot runs almost all the way around the unit, except for strategic breaks to route airflow. But there’s one kind of heat the Omen wishes to embrace. The chrome-plated hinge of the Omen is tinted blue at both ends, just as a car’s exhaust tips would be after intense driving. HP hopes you’ll think “speed” as you see that effect. The gaming-oriented design continues with six programmable buttons running down the left side of the keyboard. 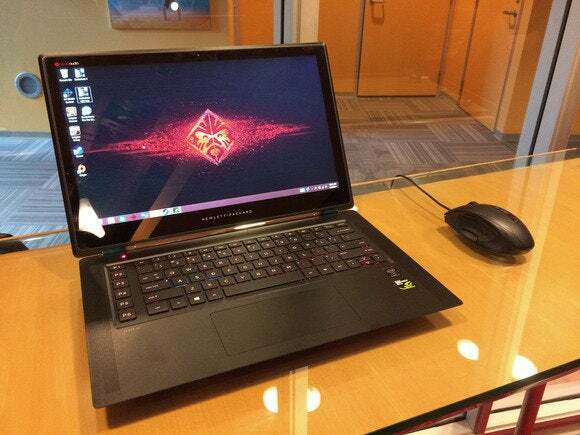 The full, island-style keyboard itself has the usual colored backlighting, but more importantly, it has a 1.5mm travel that should give gamers the responsiveness and feedback they crave. A wide touchpad sits in front of the keyboard. The HP Omen has six programmable keys running along the left side of the keyboard. You can also see the blue-tinted hinge, inspired by a car’s heat-discolored chrome exhaust tips. 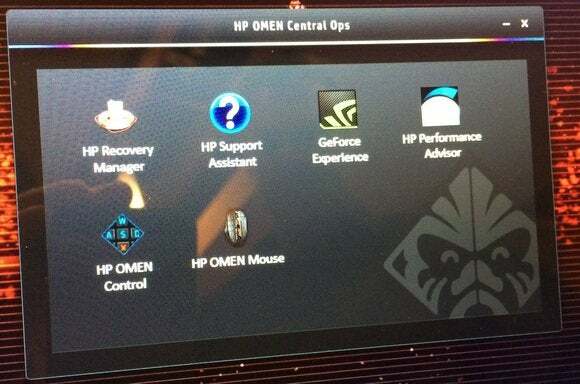 Gamers can tweak the computer’s gaming settings and analyze performance through the Omen Central Ops collection of utilities. You can use HP Omen Control to customize key assignments, as well as the lighting for the keyboard and the Beats Audio speakers that run up and down the full depth of either side of the keyboard panel. There's even a utility to program the optional Omen Gaming Mouse x9000 ($60), which is expected to be available in November. The HP Omen’s Central Ops utility lets you set or disable various features for gaming, such as keyboard color and key assignments. Another thoughtful note: The ports run along the back of the unit to minimize clutter. They include AC, four SuperSpeed USB 3.0, HDMI, mini-DisplayPort, and an audio jack. An HP USB Ethernet adapter is bundled with the Omen, and 802.11ac Wi-Fi and Bluetooth are optional. All of the HP Omen’s ports are on the rear of the chassis to help control cable mess. I couldn’t run full benchmarks during our briefing, but I did get to play Borderlands: The Pre Sequel, a fast-paced game. As I ran, reloaded, and fired, I saw no lag or jitter. If anything, I was the lag—I died quickly. The Omen will be available for preorder starting Tuesday, with units expected to ship in a few weeks, according to HP. The entry-level system will cost $1500 for the Intel core i7 CPU with 8GB of DDR3 RAM, the Nvidia GTX 860M GPU with 2GB of DDR5 RAM, and a 128GB mSATA SSD. A $1600 model will get a 256GB SSD with PCIe, and a $1700 model will have 4GB of DDR5 memory for the GPU. A top-of-the-line model, whose price wasn’t quite set, will rock 16GB of RAM, a 512GB SSD, and 4GB of DDR5 RAM for the Nvidia GPU. HP lost precious street cred when it laid Voodoo to rest. 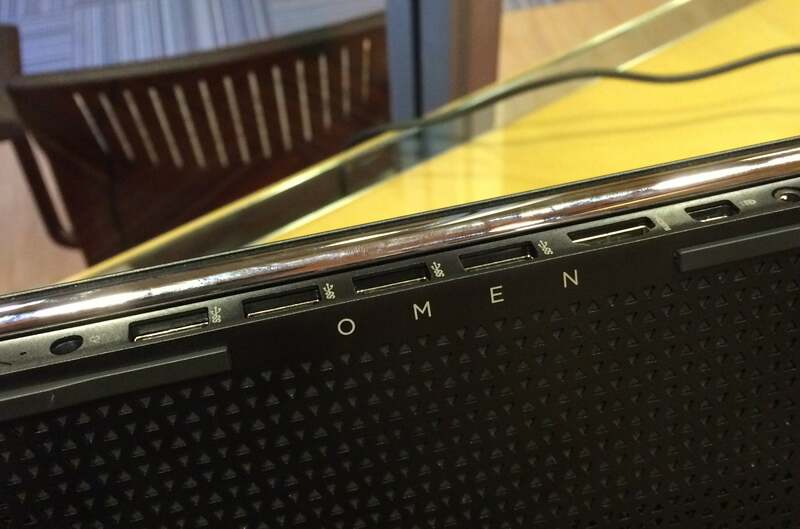 Does the Omen sound good to you—good enough to buy? Let us know in the comments.